Simonsig was founded by Fran and Liza Malan in the middle of the 20th Century and in Cape Wine terms became real pioneers in the Industry. Vintages of both Chenin Blanc and Pinotage were bottled in the late 1970s. Today Simonsig Produces Chenin Blanc and Pinotage in both wooded and unwooded versions. Kaapse Vonkel, the first Champagne style wine was made in the late 70s using Chenin Blanc. The estate is now owned and managed by brothers Johan and Francois Malan, The former, the Cellarmaster and the latter the Viticulturist. 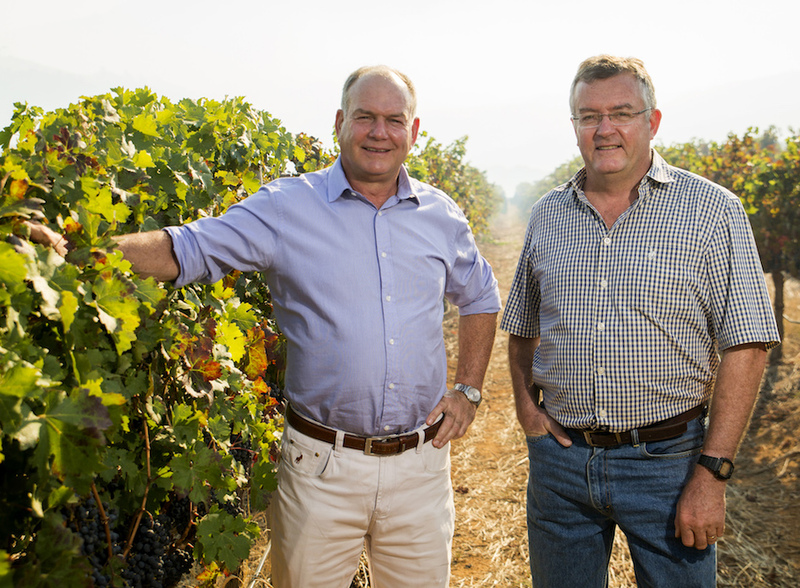 Pioneers in their own right, the brothers produce the Simonsig Reserve Collection Chenin Blanc Pinotage 2017, especially for Woolworths, a white wine made from both grapes. The juice is take off the Pinotage grapes as quickly as possible to prevent any colour leeching out into the juice. Winemaking then follows the same path as white wine. Bottled under screw cap in a clear glass Burgundy shaped bottle with an elegant label. In the glass, it is a gentle pink, crystal clear. The guava of the Chenin shining through. And plums. Crisp from entry right through to the ending. The Chenin Blanc flavours of guava and other tropical fruits are pronounced, while the red berry fruits and plum flavours give mouth feel and balance. And it is on the shelf of your local Woolworths. The Restaurant on Simonsig Estate, Cuvée will provide many choices for the superb range of Simonsig Wines. At home during Heritage Month, there are some stunning dishes you can cook on the Braai. 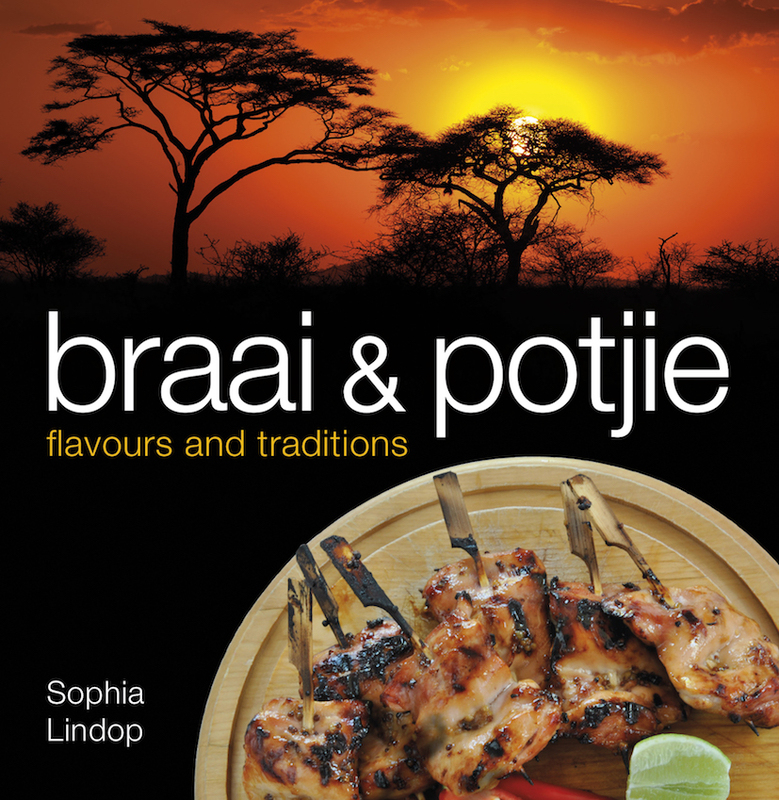 Sophia Lindop’s Smoked Stuffed Chicken from her book, Braai and Potjie Flavours. Click here to read more about Sophia. Cook the Arborio rice in the stock until tender and the liquid has dried up. Melt the butter in a saucepan and fry the onion until it begins to caramelise. Add the nuts, raisins and garlic and fry for a few minutes before adding the Muscadel and tarragon. Combine well and set aside to cool down. 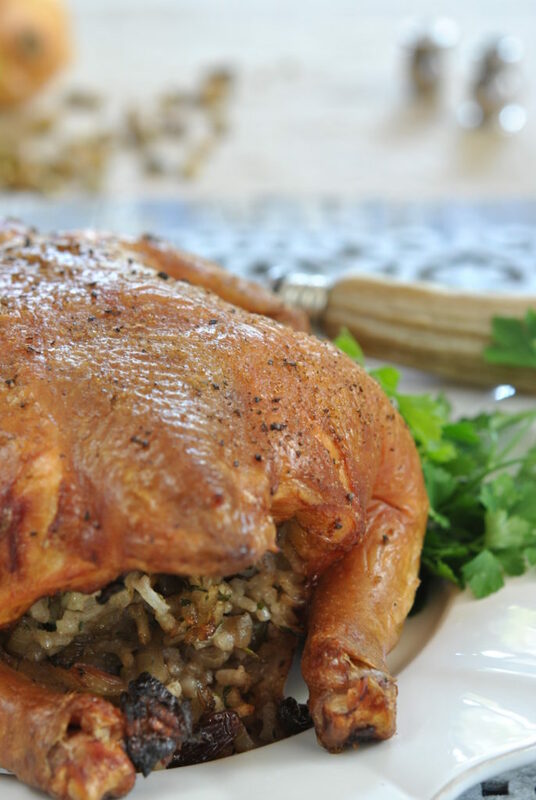 Place the whole bird on a board and stuff the rice mixture into the cavity. Secure the stuffing by using toothpicks to pull the skin over the cavity. Rub the chicken with olive oil and season both sides. Prepare the kettle braai with two beds of briquettes on either side of a drip tray. Place the chicken over the drip tray at around 350 °C and cover. Cook for 1 hour 15 minutes. Lift the lid after 15 to 20 minutes and sprinkle sawdust on each bed of coals before covering the kettle braai again. Do this about four times during the cooking process.